Ben Stokes’s last over in RR vs CSK game could advertise the hysteric brilliance of IPL more spectacularly than any glossily packaged collage featuring cartwheeling stumps and vanishing cricket balls. Ben Stokes’s last over in Thursday’s Rajasthan Royals vs Chennai Super Kings game could advertise the hysteric brilliance of the Indian Premier League more spectacularly than any glossily packaged collage featuring cartwheeling stumps and vanishing cricket balls. Those eight balls captured all of IPL’s existential fundamentals, a marketing man’s dream. From Ravindra Jadeja’s jaw-dropping six, a rookie umpire’s naivety, Dhoni temper tantrum and finally the Dilton lookalike Santner’s last-ball six, it was the perfect T20 script. A former Vidarbha Ranji player, Gandhe, 44, was officiating his first IPL game as an on-field umpire. He has played 37 first class games and 25 List-A matches. He was also part of India under 15 team. He is the younger brother of former Vidarbha captain and one-time junior selector Pritam Gandhe. It was Ulhas Gandhe, who first spotted India pacer Umesh Yadav in club cricket in Nagpur. He called Stokes’s full toss around Jadeja’s waist a no-ball but got over-ruled by the leg-umpire. 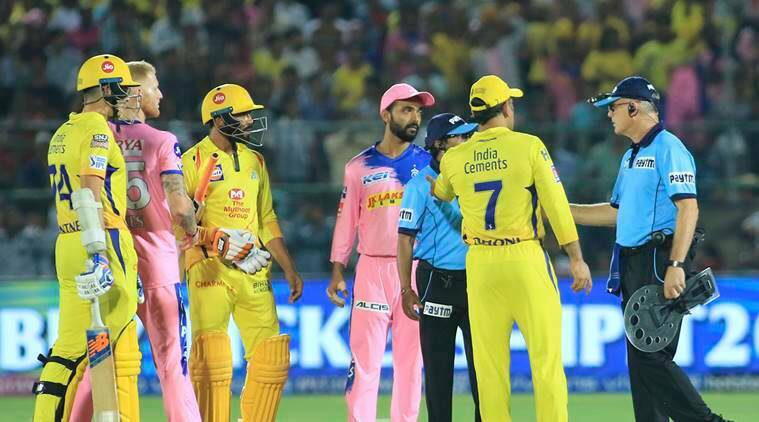 Gandhe’s mistake led to heated moments, first with Ravindra Jadeja, the batsman in the middle, and then with Dhoni charging in from the dugout. A self-confessed nervous player who has “always thought I’m not good enough,” Ben Stokes hasn’t had the best of last-overs in T20 games in India. In Kolkata, he lost England the T20 World cup with a series of in-the-slot deliveries to the marauding Braithwaite, and not much has changed. He did produce perhaps his best yorker to dismiss Dhoni but things went pearshaped then on. When Dhoni came out to protest with the umpires, Stokes had a calm chat with him. He isn’t having the best of IPL, scoring 104 runs and getting 6 wickets in 6 games. The Thala acted more like a mass-leader than a captain. He seemed as much flustered by the heat of the moment as consumed by his own larger-than-life halo. So when he felt that his team was being cheated, he seemed to think that it was his duty to cross the line. Dhoni’s rare act of indiscretion also exposed franchise cricket’s cut-throatism. IPL is no hit and giggle jamboree, there are no quarters given or asked. Even a rare defeat for the team on the top of table can trigger a slide. It was a day when the man reputed to be T20’s mythical finisher got out with 3 balls to go and 8 runs to score. It was also the day when even Dhoni snapped to the pressures of IPL. A reader of crime thrillers, Bruce Oxenford found himself in thick of action when he had to convince Dhoni that as the square-leg umpire, it was his call to rule it a no-ball on height. The 59-year-old former Australian was on a two-year break after retiring as a professional at 34. It was then that a former umpire suggested him to switch to officiating matches. He has umpired in 55 Tests, 90 ODIs, and 20 T20 internationals, is an avid golfer, and is also known for designing and wearing a lollypop-shaped protective shield on his arm. 19.1: Ravindra Jadeja falls down while drilling the ball back past Ben Stokes for a six. Laughs all around. 19.2: Stokes oversteps and bowls a full toss, which is bludgeoned through extra-cover by Jadeja for a single. 19.2: It’s a free hit and Dhoni slaps Stokes straight down the ground and scampers for a double. 19.3: Stokes nails Dhoni with a perfect yorker. The CSK captain departs for 43-ball 58 with three sixes. 19.4: Stokes bowls a waist-high full toss. Gandhe signals no-ball, is over-ruled. Dhoni storms onto the field. 19.5: Santner swats a slower delivery to long-on from Stokes that fetches a couple of runs. 19.6: Stokes bowls a wide. Santner swings his bat, but misses. CSK need 3 runs from the final delivery. 19.6: Santner smokes a slower delivery from Stokes down the ground for a six. CSK win by four wickets.